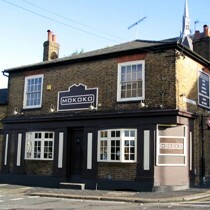 Previously The Harrow pub, Mokoko is a smart cocktail bar in Verulam Road, just past Cinta Chinese restaurant. Mokoko is aimed at the 25 plus age group who wish to drink cocktails and champagne and eat tapas style food. We declined the cocktails (they cost from £5.50) and chose some of the premium lagers and bottled beers on offer. As expected no real ale was available. The decor is quite stylish and seems to follow a 70's theme. There's an unusual terraced garden to the back of the bar that's well worth a look. The quiet background music helped to create a pleasant atmosphere to drink in. Most people drinking in the bar at the time of our visit were smartly dressed and their age ranged from mid-twenties through to early forties. Women would find Mokoko particularly appealing with it's smart interier and range of cocktails. This place is better than expected and despite the lack of real ale it is worth a visit to try it out. "Having visited Mokoko a few times now, I continue to be impressed with the quality of drinks, the friendliness of the staff and the relaxing and welcoming ambience of the bar. There is nowhere else in St. Albans that can provide the high quality cocktails found at Mokokos, nor anywhere that the staff are so well versed in the products they sell. I would highly recommend this bar to everyone." "Our local. Great Bar. Fantastic Cocktails and really knowledgable and friendly staff. Couldn't hope for a better neighbourhood bar. Gets crowded on Fridays and Saturday nights so best avoided but try Sunday nights, much quieter with relaxing music and a very laidback atmosphere."